Like all expansionist aggressors and colonizers China, having invaded then occupied lands such as Tibet, East Turkestan, Southern Mongolia and Manchuria enforces policies upon those subject peoples, which seek to assimilate and eradicate cultural values and traditions. The native peoples of North America suffered such an assault, as did the Irish under British rule. Presently Tibetan children are being forced to learn Chinese, yet another example of this process, the aim being to Sinocize a generation and thus extinguish a sense of national identity. The tyranny which conducts such a cultural genocide not only seeks to ensure a dilution and eventually extinction of a peoples tradition, history and language, but through force seeks to justify its claims over the territory it has invaded and occupied. After all the world must be convinced, and what more persuasive and relatively objective evidence is there than a map. The geography of the imperialist. China has done just that during its illegal occupation of Tibet, indeed the communist regime even has a ‘Place-Names Committee’ which is tasked to engineer Chinese versions of all the settlements and natural features in areas under China’s control, which are then imposed. Tibetan place-names are disappearing fast across Tibet’s landscape, rivers, mountains and sacred sites are being re-branded as ‘Chinese’. Not only is this an demonstration of colonialism, but equally a key propaganda exercise to promote China’s bogus claims that Tibet is legitimate Chinese territory. In fact it is not at all, but the illusion of a map, complete with Chinese named locations and features has a power to convince, and that is the objective. We can of course expect little else from a totalitarian regime such as China’s, it has been redrawing the maps of lands it has invaded and promoting such deceptions for many years. 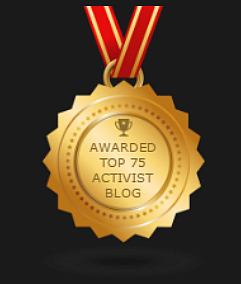 What though are we to make of organizations which seemingly value human rights, freedom, and justice yet who are collaborating with China in assembling and promoting such cynical distortions? Enter Google Earth! 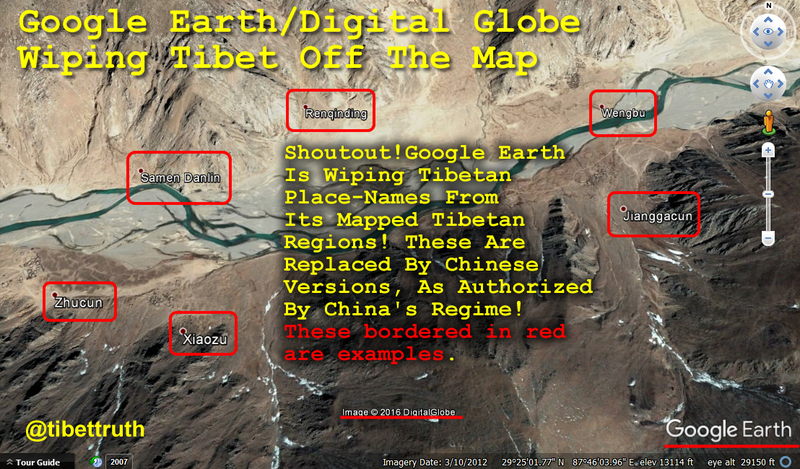 As folks who follow our account across Twitter may have noted, recently we launched an awareness campaign to bring attention to the troubling fact that Google Earth is wiping Tibetan place-names from its global maps. These are being replaced by Chinese versions, no doubt to the approval China’s regime, whose psychopaths must be delighted that their geographic disinformation is being promoted by the internet’s go to map resource. We must presume that Google Earth has no ethical concerns about being complicit in a process that endorses colonialism and defines territorial legitimacy by military invasion and occupation. 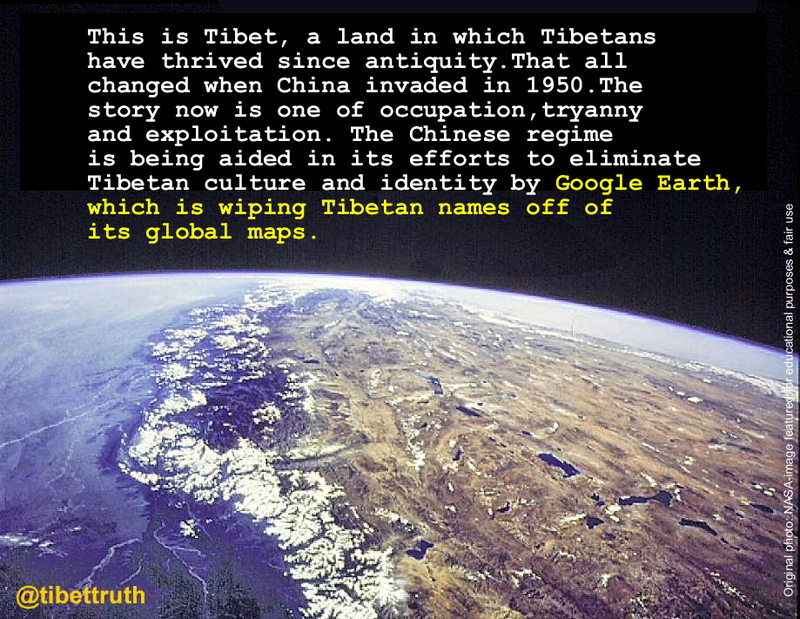 Or as in this case, based on the assertions of a regime which is not only erasing Tibet from the map, but also violently suppressing Tibetan culture and its people. Well since Google Earth seem willing partners in publishing the geographic propaganda of the Chinese authorities we can expect that it will be amending its map of Arunachal Pradesh (part of India), which China has again recently claimed sovereignty over. Indeed China’s Ministry of Civil Affairs announced April 14 that its has renamed six locations in that region as; Wo’gyainling, Mila Ri, Qoidengarbo Ri, Mainquka, Bumo La and Namkapub Ri. http://timesofindia.indiatimes.com/india/china-announces-standardised-names-for-6-places-in-arunachal/articleshow/58253902.cms Of course China makes the usual noise about this being about its ‘territorial sovereignty’, the truth is that the area in question traditionally, historically and ethnically was within the sphere of influence of Tibet! The claims issued by China are no more than a calculated fabrication, political machinations that seeks to expand its control. Not that such facts have troubled Google Earth who are peddling as geographic fact, the falsehoods and deceptions of China’s Ministry Of Disinformation.